The biggest names in classical music, along with promising young stars, will meet in Castelnuovo Garfagnana from June 25 to July 7, 2016 for the IAM Festival. The International Academy of Music Festival, the event that from 2003 brings to the Serchio Valley some of the best chamber music performers from the international scene, is now in its 14th year. The event, which benefits from the economic and institutional support of the Tuscany Region and is part of the regional “Festival Tuscany”, project attracts every year around 200 musicians from five continents enlivening Castelnuovo, the Serchio Valley and Lucca, thanks to the organization of the Civica Scuola di Musica di Castelnuovo Garfagnana. This year guest artists will include Dmitri Berlinsky, Regi Papa, Benjamin Capps, Gena Raps, Yuri Kim and several others. The Festival is also supported by local institutions such as the Municipality of Castelnuovo Garfagnana, Tuscany Region, Province of Lucca, Union of Municipalities, Proloco of Castelnuovo. To make the event possible are the Fondazione Cassa di Lucca, the Fondazione Banca del Monte di Lucca and the Banco Credito Cooperativo di Versilia Lunigiana and Garfagnana. Alongside them is the “Giacomo Puccini” Conservatory of La Spezia, Guidi Gino and Idrotherm. 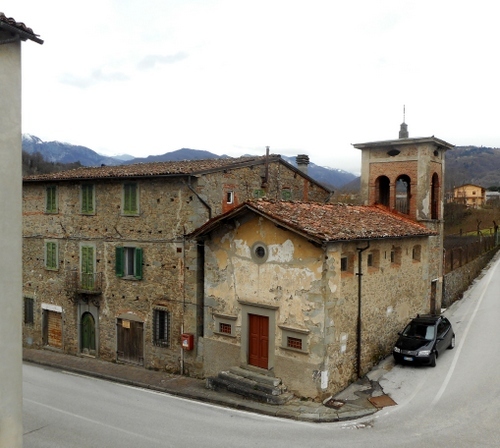 The special feature of this festival are the prestigious music courses, taught by world-renowned performers and teachers, attracting students from all over the world to Garfagnana. 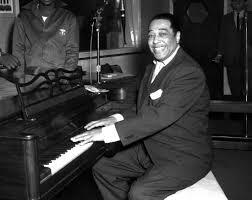 The festival starts on Saturday, June 25 at 9.15 pm in Piazza Umberto I in Castelnuovo Garfagnana with a “Duke Ellington”, evening with free admission. The protagonists of the grand opening will be the Big Band and the La Spezia Conservatory choir directed by Daniela Contessi (see photo) who will perform in “the II sacred concert”, one of the greatest masterpieces in jazz history written by the ‘Duke’. The evening performers will include Mauro Avanzini, Manolo Nardi, Giacomo Montanelli, Piero Gaddi, Andrea Leone and Ernesto Tacco. Tickets: concerts 9 euros (reduced to 5 euros for members of Castelnuovo di Garfagnana Civic School of Music and those under 18 and over 65) + 1 € presale. Free entry to concerts by the students. Facebook “International Academy of Music”. Tuesday, June 28 at 9.15 pm, at the Teatro Alfieri, German pianist Wolfgang Manz will give a recital with music by Franz Liszt (4 transcendental studies, 3 characteristic passages from the opera “Venice and Naples”) and Sergei Rachmaninov (3 Romance, Etudes-tableaux op. 39). Thursday, June 30 at 9.25 pm at Castelnuovo Garfagnana’s Capuchin church there’s a Schubert evening. Mattia Zappa, cello, Massimiliano Maionolfi, piano and Dmitri Berlinsky, violin will perform the sonata in A minor, the trio in Bb op 99 and Dvorak’s Waldesruhe and Rondo. Friday, July 1, from 6 pm to midnight, the streets of Castelnuovo’s historic center will be enlivened by a series of free outdoor concerts. Under the loggia in Ariosto square there will be classical and popular music performances by some of the most promising students from the Suzuki orchestra. The evening continues at 10 pm with a final free concert by Amores Tangos in Piazza Umberto I with Jose Teixido (guitar), Nicholas Perrone (bandoneon), Sebastian Noya (bass) and Juan Tarsia (piano). Saturday, July at 5 pm in the Saletta Suffredini there’s a free concert for young people with a recital by the young talent of pianist Aleksandr Bolotin, who plays Beethoven, Schubert, Liszt and Chopin. Saturday, July 2 at 9.15 pm, in the church of the Cappuccini there’s a concert dedicated to Natalia Strelle, a pianist who died last summer. It’s entitled “Classicism and dance” and stars Virginia Ceri Angel Andrea Tavani (violins), Elizabeth Sciotti (cello) and Francesca Profeta (viola). They perform the Quartet op. 44 # 4 – “the tyrant” by Lucchese master Luigi Boccherini. 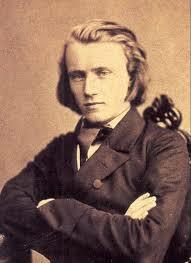 Afterwards, Gena Raps and Albert Lotto piano will play Brahms and Dvorak’s, “Hungarian Dances” and “Slavonic Dances”. The evening ends with one of Mozart’s masterpieces, the G minor Piano Quartet with Regi Papa (violin), Linda Veleckis-Nussbaum (purple), Berthine van Schoor (cello) and Gena Raps (piano). Sunday, July 3 at 9.15 pm (the Mont’Alfonso Fortress) gala concert of the best students. Free admission subject to availability. FINAL EVENING OF THE MUSIC COMPETITION IN SALA SUFFREDINI CASTELNUOVO. Monday, July 4 at 9 pm in Sala Suffredini, the finest talents from the festival will perform on the Music Competition’s final evening. Free admission. Tuesday, July 5 at 3 pm 15 at the Palazzo Ducale in Lucca there’s a new appointment with a gala concert given by IAM’s best students. Tuesday, July 5 at 9.15 pm the International Academy of Music Festival will return to Castelnuovo’s church of the Capuchins, where there’s a free concert evening titled “Between Vienna and Moscow”. 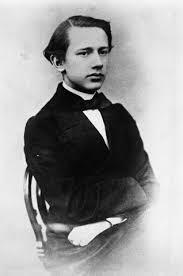 Pianist Phillip Kawin performs Brahms Rhapsody in B minor. Op. 79 # 1 and Schubert’s beautiful Klavierstucke 3 D946. Francesca Girardi, violin, and Rossella Piegaia, piano, perform Brahms’s sonata in A major op. 100. Tchaikovsky’s Trio in A minor. op. 50, with Jacob Gilman, violin, Eugene Briskin, cello, and Efrem Briskin, piano, concludes the evening. Wednesday, July 6 at 9.15 pm at the Teatro Alfieri there will be noteworthy performances by great names of German romanticism. 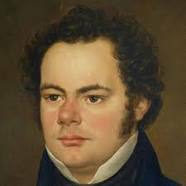 The evening opens with Beethoven’s piano sonata No. 2 in D minor op. 31 – “The storm”, played by Yuri Kim. Following is Weber’s trio op. 63 in G minor, performed by Hansgeorg Schmeiser, flute, Benjamin Capps, cello, and Albert Lotto piano. The final piece is Schumann’s Piano Quartet op. 47 in E-flat Major with Dmitri Berlinsky (violin), Regi Papa (viola), Benjamin Capps (cello) and Albert Lotto (piano). Thursday, 7 July at 9.15 pm at the Teatro Alfieri with free admission, there’s the festival’s final event bringing together the best young festival talents in a students’ concert with a concluding ceremony. One of our favourite shops in Castelnuovo di Garfagnana, which we sometimes visit for its very extensive Thursday market, is the arts shop situated just south of the Rocca Ariostesca. Apart from its artist’s equipment and framing the shop has a very extensive collection of paintings and objects d’art which should please all sorts of taste. I found the examples from Dariush, the painter of Iranian origin, particularly delightful and they not excessively priced. There are plenty of other things and it would be a strong will to escape from this cave of attractions without at least one purchase. What did we buy (or rather me)? It was a case of paints and brushes which I gifted to Sandra, again at a very reasonable price. I’ll let you know how those brushes transform the paints into little masterpieces. Meanwhile, we remind you that there are still copies of our book ‘Septet’ available at the Shelley House in Bagni di Lucca (see https://longoio2.wordpress.com/2016/02/27/septet/). Fancy owning your own little church and hermitage and founding a new religion or just retiring from the world? 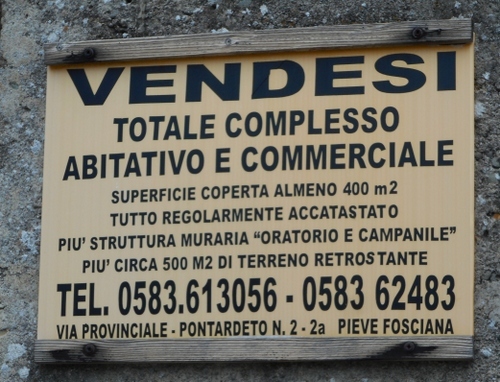 Your chance is awaiting you at Pontardeto which is a little frazione (hamlet) near Pieve Fosciana in Garfagnana. Actually, the ‘for sale sign’ has been there for some time. The property for sale includes some land as well. I’m wondering what the little church, or oratorio, is like inside and to which saint it is dedicated. Whoever it may be, this little ensemble of rustic but noble buildings is a most picturesque feature of the landscape. Will you have the courage to phone the number on the ‘for sale’ notice and find out more? I hadn’t dined at Marchetti’s in Castelnuovo for some time and it was a real pleasure to return to this shrine to good home-style cooking which is situated in one of the most picturesque areas of Castelnuovo di Garfagnana, the palazzo in the centre of town with the arches, behind the town hall. Founded shortly after World War II by the great-grandpa of the young barman trattoria Marchetti has remained in the family for over seventy years now. In the warmer season the restaurant spreads its tables out onto the portico itself but on this blustery, rainy mid-day I huddled with the other diners in the cosy interior. Indeed, even in February it’s often necessary to wait if one doesn’t book ahead. I waited just five minutes before a place was found for me. If you are a group of at least six it may be a good idea to book the tiny annexe which is almost like an Irish snug. It’s nice when the owners recognise you in a restaurant even if you haven’t been there for some time and I received a warm welcome. 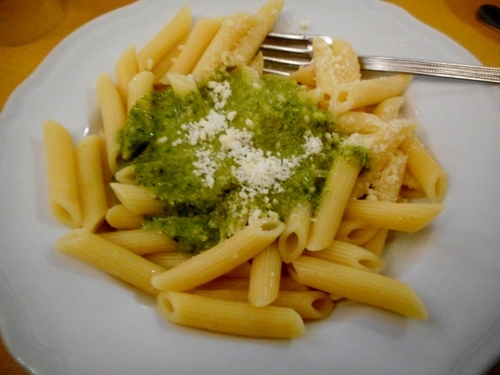 For my primo I chose penne with pesto. The sauce was abundant and exquisite, the penne al dente just as I like them. 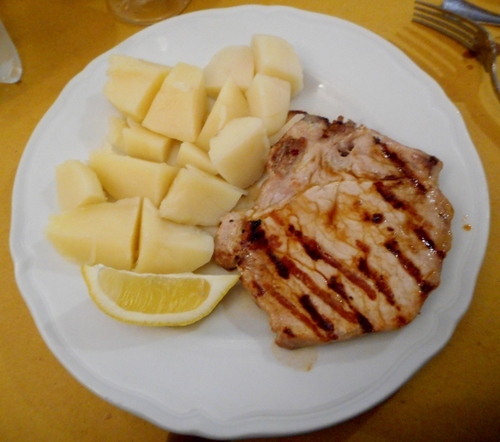 My secondo consisted of bistecca di maiale con patate lesse (i.e. pork chop with boiled potatoes). Again, the ingredients were cooked to perfection and I doubt whether I have enjoyed such a chop for some time. Wine was as-you-please from a big (shared) fiasco on the table and water could be ordered either stilled or bubbly. I rounded off the meal with a caffé macchiato, nicely frothy as I like it. As usual, grated cheese, bread and condiments were supplied as part of the meal. 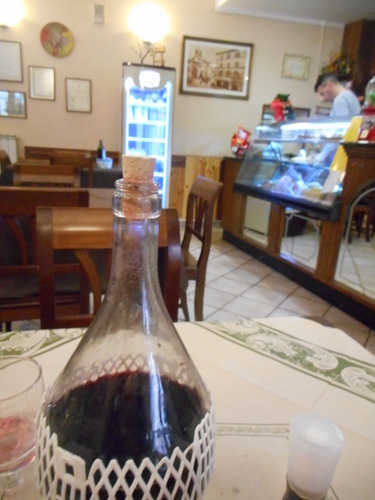 Thankfully, tipping is not normal in family-run restaurants in Italy and my delicious lunch cost me just ten Euros – less than what I am now reliably informed is the price of a standard take-way fish ‘n chips in London. The restaurant has some interesting old photographs and mementoes on its walls which are worth looking at. Like a few other places its decor doesn’t seem to have been updated for years and it has a quaint unplanned retro feel about it which I like. It was good to have a good Italian workers’ lunch before I embark tomorrow into the wilds of northern Europe, in particular to the great Wen (term coined in the 1820s by William Cobbett for London when he saw how rapidly it was expanding just like a sebaceous cyst on the face, which is what ‘wen’ means).